A pilot escaped without injury after making an emergency landing in his light aircraft next to a river in North Yorkshire. Police said the incident happened at 10:30 BST near the village of Tockwith, which is 10 miles (17km) west of York. 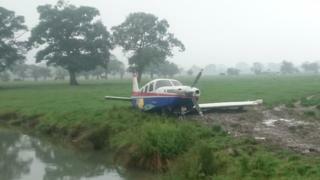 North Yorkshire Police said it was believed the aeroplane had suffered engine failure. Sgt Andy Graham, who attended the crash, praised the "great piloting skills resulting in no injuries".